HMV: "We're expecting the product to be sold sooner rather than later"
Microsoft's Xbox 360 Elite will launch in the UK at some point in the late summer. That's according to an HMV spokesperson in London this morning. The man spoke to Eurogamer , saying: "All we understand is that it's at some point perhaps around the late summer, but we don't know anything beyond that." "We're expecting the product to be sold sooner rather than later, and obviously nearer that point we'll have a fuller idea of all their launch plans, precise timings, pricing and everything else from a retail point of view we're likely to know." Microsoft announced this morning that there will be a black Xbox 360 launching from next month with an HDMI connection and a 120GB hard drive. 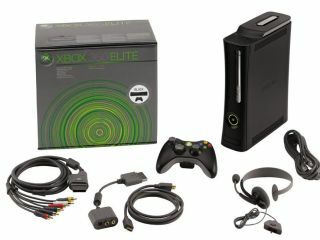 Called the Xbox 360 Elite, the PlayStation 3-challenger will only be available in the US initially. But these comments from HMV suggest that keen British Xboxers won't have to wait too long.